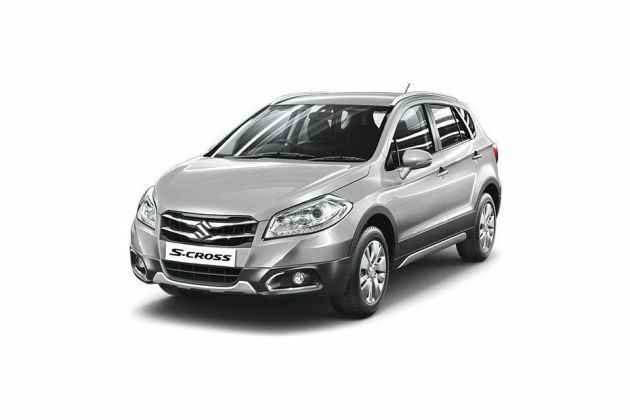 Maruti is among the nation's most recognized car makers, and it has released the much awaited S-Cross. This model falls into the premium crossover segment, and has been built with a high level of anticipation from the public. It is available in a total of eight variants, one among which is the Maruti S Cross DDiS 200 Sigma . This is the lower end variant, and it offers a moderate list of features. Its interior arrangement consists of fine upholstery for the seats, chrome highlights and a variety of other decorations for a good drive environment. There are a load of comfort features as well like a map lamp in front, storage compartments and cup holders. An advanced entertainment unit is also present along with a monitor screen for the best experience. This variant is fitted with a 1.3-litre turbocharged diesel engine. This trim gets superior grade control functions for ease of handling. It also gets with strong disc brakes and a robust suspension system that makes the drive experience both fast and pleasant for the driver. A highlight of this vehicle is its Suzuki specialized body format, which aids in protection from impacts. The exterior format of the vehicle boasts a strong appeal. Its muscular and toned demeanor goes along with an elegant overall look. Its attractive headlamp clusters, wheel rims, body curvatures and flawless metallic skin together make it a visual treat for its passengers, and for those on the road. This crossover has a masculine build that is also streamlined and good looking. At the front, the chrome front grille makes a good design statement. The headlight clusters on either side of this are stylish in shape. At the bottom, there is a large air intake section, providing cooling to the engine. The silver skid plate garnish improves the car's appealing look. The vehicle's toned persona is further enhanced by the wide hood. Coming to the side profile, the steel wheels are good looking, and they come along with a center wheel cap. The wheel arch extension adds emphasis to this effect. The outside rear view mirrors are body colored, and they come with turn lamps for safety value. The door handles are also body colored, blending into the vehicle's overall image. A blackout effect on the B-pillar further improves the car's look. Coming to the tail section, a more muscular build lends style to the vehicle's overall picture. Furthermore, the split style rear combination lamps are also good looking. The cabin offers a modern and comfortable atmosphere for its occupants. The seats are arranged to ensure a good level of space and convenience for all of the passengers. Fine fabric upholstery is present on the seats, enriching the drive environment. Furthermore, the passengers get the benefit of fabric door armrests, allowing convenient arm placement. The AC louvre knobs come with a chrome finish, further adding to the refined quality of the cabin. An attractive steering wheel is present, with buttons by the side for ease of working. Hosted beside this is a display monitor that gives a sophisticated touch to the place. The parking brake lever comes with a chrome tip, adding quality to the driver's experience. Beside all of this, the cabin also offers a lot of convenience functions as well. There is a glove box along with a back pocket on the front seat and a cup holder for storage purpose. This variant is fitted with a 1.3-litre DDiS engine that has a displacement capacity of 1248cc. The engine has four cylinders incorporated through the DOHC configuration. Furthermore, the drive-train is equipped with a turbocharger for improved performance. It is given the common rail fuel injection for efficient fuel transfer. Further, it produces a power output of 89bhp at 4000rpm and a torque of 200Nm at 1750rpm. The engine is paired with a 5 speed manual transmission that eases the shifting of gears. The vehicle has ventilated discs for the front wheels, and drums for the rear. Coming to the suspension, there is a McPherson strut along with a coil spring for the front axle. The rear axle is equipped with a torsion beam along with a coil spring for improved ride stability. This trim has a TFT information screen that displays fuel consumption, trip meter and the outside temperature. It also gets the 7 step illumination control facility as well. In terms of audio facilities, this variant does not offer much. Central locking facility is present along with keyless entry system for added convenience. This trim also gets power windows featuring driver side auto up/down facility along with anti pitch. The outside rear view mirrors are electrically adjustable. Tilt steering also comes as a standard feature for this variant, reducing burden for the driver and promoting a safer drive. There is manual air conditioning system that provides a fine environment for the drive. Additionally, there is a filter for dust and pollen for added drive ambiance. The driver and the co passenger are given vanity mirrors. The occupants are given the benefit of an accessory socket at the front, allowing for charging external devices within the car. There are bottle holders by the door trim, giving storage facility for the passengers. An electric back door opening facility provides relief for the driver. Firstly, there are airbags for b oth the driver and front passengers, shielding them from mortal danger in case of mishap. Next, the vehicle has been engineered with a Suzuki TECT body template, granting the passengers protection in times of mishap. A dual horn allows the driver to alert nearby vehicles for stricter safety. The car is gifted with good headlamps, and these come with a headlamp leveling function for added visibility and safety. Beside all of this, there is a lamp and buzzer that serve as driver's side seatbelt reminders. 1. It could be blessed with a touchscreen infotainment system. 2. Its safety arrangements can be improved.